Compression ratio improved by 10 % due to the coordination with other compression tools. KYOTO — April 28, 2006 — Sophia Cradle Incorporated (Headquarter: Kyoto; CEO: Kazunori Sugiyama), an innovative developer of mobile phone software, today announced to release SophiaCompress(Java) [*1] 4.1. This latest version is capable of compressing JAR files obfuscated [*2] by other compression tools (ProGuard , etc...) for mobile Java apps. Also, KZIP and other ZIP archives [*3] can be used for compression. 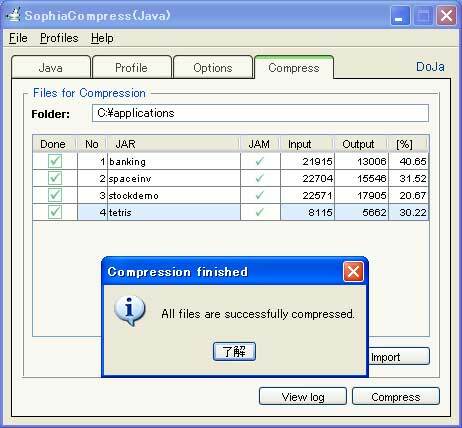 Due to these improvements, the compression ratio has improved by 10 % at the average and 18 % at the best. .
April 28, 2006, Sophia Cradle Incorporated has released SophiaCompress(Java) 4.1, the compression tool for mobile Java apps. This latest version is capable of compressing JAR files obfuscated by ProGuard or other kind of compression tools, and it is capable of using general ZIP archives such as KZIP. For example, by using ProGuard and SophiaCompress(Java) together, the compression ratio has improved by 6 - 7 %, by using KZIP for ZIP compression, the ratio has improved by 3 - 4 %. Overall, the compression ratio has improved by 10 %. 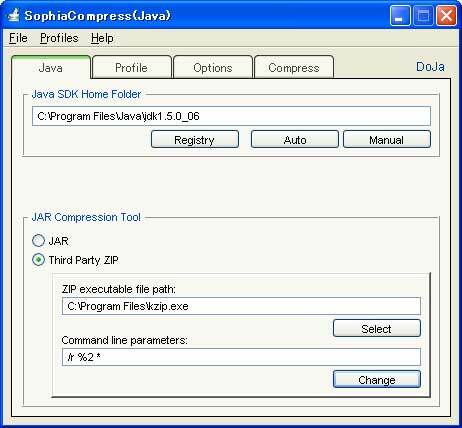 SophiaCompress(Java) has class integration functions and data sharing between JavaVM and its applications, that ProGuard or other compression tools don't have. However, ProGuard has useful functions such as optimizing constant expressions. The idea of this release up is to enhance coordination with other compression tools. Became capable of handling obfuscated JAR files. ZIP archives of your choice can be used for compression. 1. Choosing the ZIP archive for compression. 2. Capable of compressing multi files at once. When a Java application is reverse compiled, it is easily restored into its original source code. Because of its vulnerability to reverse compiling, Java had some problems when used for commercial applications. Obfuscator rewrites field names and method names in the source code to short names (1 - several letters long) to make it difficult to read after being reverse compiled. As a result, it reduces the size of the application, so it is widely used as compression tool for mobile Java applications. ProGuard and RetroGuard are the most famous. JAR files for mobile Java applications are made up of ZIP-compressed class files and resource files. Therefore, ZIP archives may be chosen optionally when building JAR files. There are ZIP archives that have better compression ratios than "jar.exe", the standard JAR building tool. So by using other ZIP archives for compression, better compression ratios can be achieved. KZIP and 7-Zip are the most famous.